Efficient and robust wireless infrastructure is essential for public transport – We have moved – Follow us on www.telestehub.com! It has always been challenging to build 24/7 working and reliable, better yet customer satisfying wireless infrastructure to this mobile and ‘living organism’ called public transport. The public transport is not only about moving vehicles, which are time to time connected with stations and depots. It is also about the limited capacity of wireless infrastructure as well as challenging conditions which make it difficult to enable constantly reliable and sufficient wireless capacity for the needs of the different subsystems. In the public transport ecosystem there are two main elements which need a 24/7 wireless communication link: the fleet and operator. The fleet, i.e. set of vehicles, can be connected with operator through different wireless mediums, such as 3G, LTE or Wi-Fi, TETRA, and GSM-R. These technologies constitute a so called ‘data pipe’, the wireless capacity between operator and the fleet. In daily operations the capacity of the entire data pipe is split between several subsystems, including Passenger Information System, diagnostics, Train Control Management System signaling, CCTV and passenger/staff Wi-Fi. The consumption of the data pipe can be said to be on ‘reasonable level’ by the all other subsystems, except CCTV and Passenger/staff Wi-Fi – the latter mostly due to the ‘passenger-part’. 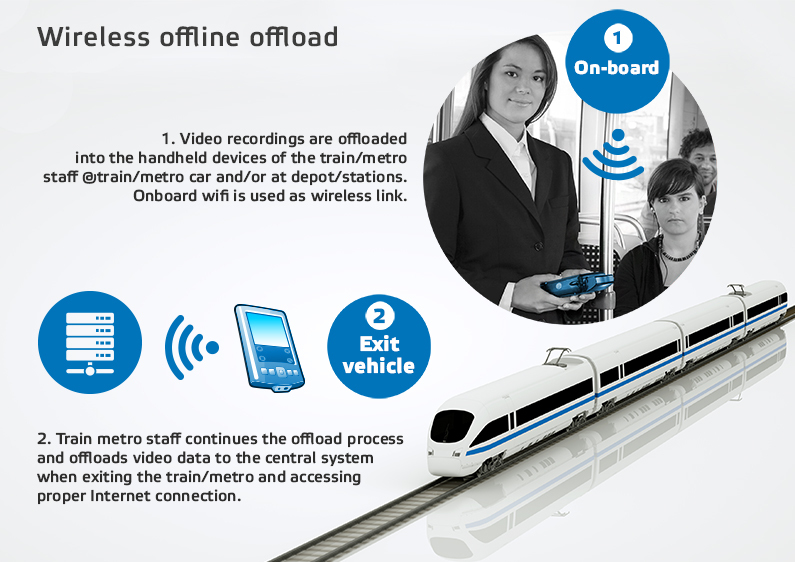 Both CCTV and passenger/staff Wi-Fi use 3G, LTE or Wi-Fi as a wireless medium. No bones about it, CCTV is the most safety critical of these two, and by default, it should be prioritized whenever the data pipe shows signs of exhaustion. Today, it can be said that all new public transport projects include CCTV systems. Also, the trend of CCTV installments into the existing systems is growing rapidly. From the wireless perspective, the on-board CCTV has two main functions. The first one of these is called ‘live view’, which means live access to the on-board CCTV cameras or cameras in train/metro station platforms. The second one is ‘wireless offload’, which refers to the continuous procedure of moving recordings from on-board system to the ground system. Wireless offload also be can be operated in ‘on-demand mode’, which means that the recordings related to specific alerts are prioritized in the offload process. As the commonly used minimum resolution for video recordings already reaches 1080p today, and is very likely to soon become 4K, transferring video recordings keeps the data pipe busy for sure. For the wireless offload the dedicated ‘Wi-Fi-Wi-Fi’ architecture is the most efficient. It is not competing with the passenger/staff Wi-Fi, as the offload is done while stopping at the stations/depot whereas the passenger/staff Wi-Fi is typically most crowded ‘on the move’. While the burden for the wireless infra and the precious data pipe seems to be excessive, luckily the wireless technologies are evolving. The latest Wi-Fi standard 802.11ac with 3×3 MIMO can already reach almost Gigabit throughput (for single user in ideal conditions). However, the wireless infra in public transport systems is very harlequin, ranging from really good to not existing at all. Hence, even with the latest technology, wireless infrastructure is not always sufficient for enabling needed applications. To overcome the problem of insufficient wireless infrastructure, new ideas and technologies are needed! Recently, Teleste has been working with two new approaches to overcome the problem of insufficient infrastructure and throughput capacity. These are ‘Wireless Offline Offload’ and ‘Multi-gigabit wireless link’ and more information of them is available through our website. Wireless offline offload, a concept which was published at 30th ICOIN conference @Kota Kinabalu, defines a cost-efficient wireless offload solution that is independent on the infrastructure outside on-board system. Download the white paper from here.